Once each year, IGNITION: Future Of Digital brings together 700 senior executives from the worlds of technology, media, entertainment, investing, finance, and the Internet to explore the emerging business models of digital media. A major land grab is occurring for the digital consumer. It's rapidly disrupting longstanding business models. Mobile and social are reconstituting our media experiences. "Media" no longer encompasses just content, but also commerce, payments, mobility, and platforms. Big data, user content, cord-cutting, always-on: these are key elements defining the emerging web economy. At IGNITION we'll discuss the innovation that matters, who will win, and what you can do to keep ahead. The conference is produced by Business Insider, one of the fastest-growing digital-media companies in the world, and hosted by Henry Blodget, Business Insider's Editor-in-Chief and CEO. If you must cancel for any reason you must notify us in writing by October 11, 2013, for a refund less a $100 processing fee. Cancellations received after October 11, 2013, are non-refundable. 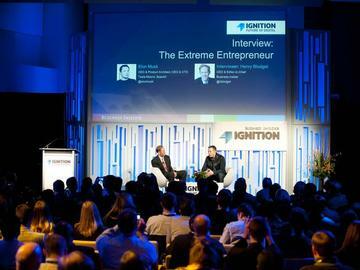 You may transfer your registration to another person by November 6, 2013, by providing authorization to us at ignition@businessinsider.com. Confirmed and paid attendees who do not attend or who cancel after the deadline are liable for the entire fee.